Fle3 — 10 (or 20) years ahead of its time ? I just got an email from a graduate student in US asking would it be possible for him to take a look of the Fle3 with a visitor user name and password. 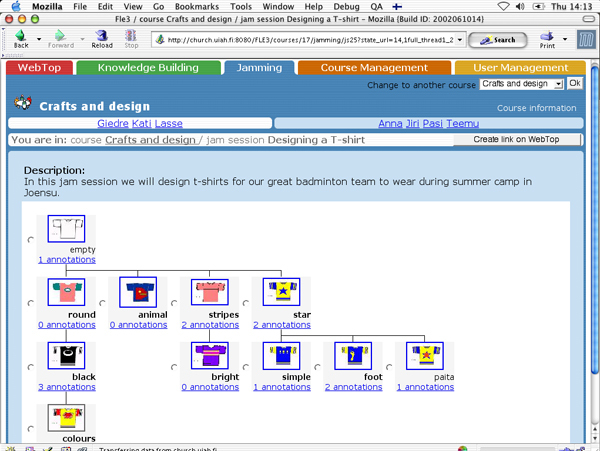 Fle3 is server software for computer supported collaborative learning (CSCL) designed and developed in our research group, released in 2002 (first version in 1999). I get this kind of requests about twice a month. My common practice with these is that I just send people the user name with the teacher’s rights. This time — I do this maybe once in two years — I decided to check whatever our Fle3 demo server is still up and running. Tarmo has setup the server so that it is pretty much bullet proof but sometime it is good to check that everything in there is ok. So, It was not a surprise for me that the server was up and running, but a surprise was that when clicking a bit around in Fle3 I realized that it is still very relevant collaborative learning environment. In a way it is maybe today more relevant than 10 years ago when the first version of Fle3 (just called FLE at that time) was released in 1999. In the late 1990’s and early 2000, the Web was not very social or collaborative. Learning with Collaborative Software – A guide to Fle3. In a way Fle3 was (and naturally still is) a social media and social networking service. For instance, it has a lot of similar features to Facebook, but with a special focus to support learning projects. In Fle3 you always work with a group of people you trust and are willing to share your most stupid thoughts and ideas. This is because sharing your early hypothesis and theories is important in learning and you rather do it with people you trust. For instance, Fle3 is very strict with privacy: you work and share things only with your class or group of students with whom you have build a social cohesion in a level that everyone can trust each other. When Facebook is now claiming that privacy is no longer a social norm we may expect that closed network services will become more popular. I assume people need social online spaces (like Fle3) where one can be open with their “friends”, without a fear of someone using your early ideas and pondering against, you or your data/media to sell something to someone. Practically speaking, there are needs for different kind of services: open and closed, socially and technologically open and closed. This is why in our research group we are also interested in to develop fully open tools that could support the idea of knowledge building in the open Internet. I will write about this another post, soon. Posted in Collaboration, educational tool, Open Source, Social Software. Next Post Finland and education export: IKEA of schools?